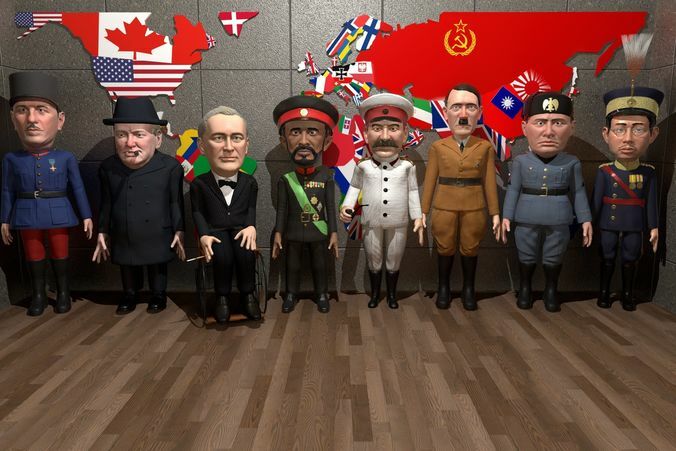 Collection of 8 stylized world war 2 era leaders. All made for game engines, optimized for Unity mecanim (unity pack included), low poly, rigged, PBR textured and animated characters. Hitler, Stalin, Emperor Hirohito, Winston Churchill, Franklin Delano Roosevelt, Emperor Haile Selassie, Charles De Gaulle, Benito Mussolini. File formats included for each character: -Maya (bout rigged in T-pose and animated) -FBX (bout rigged in T-pose and animated) -Unity pack with all of them together -OBJ files in T pose in case you would want to rig them yourself. -PBR Textures in PNG format. Color, normal, spec and metalic maps. Each character contains one animation. Hitler contains 5 animations, Stalin and FDR contain 2. FDR is provided with wheelchair and in standing up. Each character can be purchased individually on my store. Go to my profile and find them individually in case you need only one. Browse my store to see more of my work. Contact me if you like my style and would want me to make custom characters for your projects.